These previously unpublished, beautifully rendered works of fiction are a testament to Kurt Vonnegut's unique blend of observation and imagination. Here are stories of men and machines, art and artifice, and how ideals of fortune, fame, and love take curious twists in ordinary lives. An ambitious builder of roads fritters away his free time with miniature trains—until the women in his life crash his fantasy land. Trapped in a stenography pool, a young dreamer receives a call from a robber on the run, who presents her with a strange proposition. A crusty newspaperman is forced onto a committee to judge Christmas displays—a job that leads him to a suspiciously ostentatious ex-con and then a miracle. 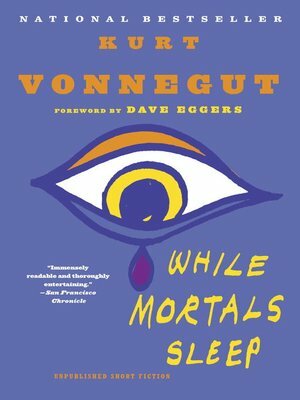 Featuring a Foreword by Dave Eggers, While Mortals Sleep is a poignant reflection of our world as it is and as it could be. "With His Hand on the Throttle"
"The Man Without No Kiddleys"